Piazzale Roma is a square on the island of Venice close to the only bridge (Ponte Liberta) from the mainland. Besides the nearby port, it is the only place in Venice where motor vehicles are allowed. All buses and trams from the mainland arrive here. Most of the car parks are also around Piazzale Roma. The big main station Santa Lucia is only about 150 meters away. Almost all locals and tourists who cross the bridge to Venice by lbus or tram arrive at the famous Venice bus station, often many thousands of people per hour. Directly on the square Piazzale Roma all public buses and the tram end that goes. The buses from the airport also arrive here. There is no other bus stop in Venice for local traffic. From the Venice bus station at Piazzale Roma, water buses (see: public ferries in Venice) depart almost every minute. These take the many people who arrive at Piazzale Roma to various places in the old town. Between the bus station at Piazzale Roma and the main station of Venice is the wide Canal Grande. Since the new pedestrian bridge (see picture) was inaugurated in 2008, it is only a few minutes walk between the two traffic junctions. The ferries (water buses) all stop at both stations (bus and train). Nevertheless, the new bridge (name Constitutional Bridge, Ponte della Costituzione) is used by many people. The public bus stop in Venice is not far from the bridge from the mainland. Not all tourists take a public ferry from Piazzale Roma, many also continue on foot. However, the distances in Venice are quite long. St Mark's Square can be reached on foot from Piazzale Roma in about 45 minutes, other regions of the old town are even more than an hour away. Bicycles, inline skates etc. are not allowed in Venice. With a pram you should bear in mind that you always have to climb and descend steps on the many bridges. 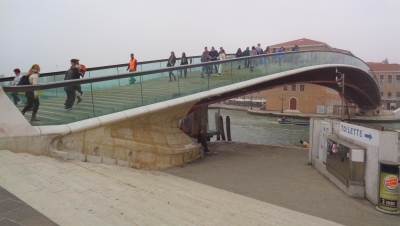 Only very few bridges in Venice have ramps for prams and wheelchairs. There are also taxis at Piazzale Roma, both water taxis and normal taxis (cars). The water taxis take tourists to the hotel in the old town, the normal taxis only bring you to destinations on the mainland. 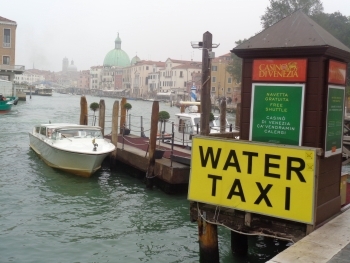 Both types of taxi can take you to Marco Polo Airport, but the water taxis are much more expensive. The water taxi station is well signposted next to Piazzale Roma square (see picture down), the white car taxis are waiting on the square. Of course, public buses from Piazzale Roma to the airport are much cheaper. You can by online-tickets on the internet for the airport shuttle buses from Venice Piazzale Roma to Marco Pole Airport. Pedestrians with a lot of luggage can also hire a porter to take the luggage to the hotel in the old town in a sack truck. Of course, this service, like almost everything else in Venice, is not exactly cheap. There are two or three parking garages next to the bus station of Venice at Piazzale Roma. 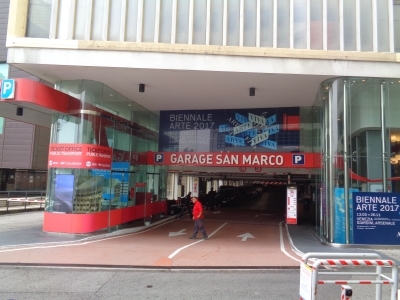 In the garage San Marco (see picture below) 24 hours parking costs 32 Euro. The other car park has similar prices. So it is better to leave your car on the mainland in Mestre and come to Venice by public transport. A single bus ticket over the long Liberty Bridge from the mainland costs only 1.50 euros, the train costs even a few cents less. You should pay particular attention in the crowds at Piazzale Roma and in the buses, tram and train for pickpockets. The area, also the neighbouring main station Venice is famous for thieves. Some important terms: In Venice, the buses to Marco Polo Airport are signposted as "Airport Shuttle". The tram is simply called "Tram". The public water bus is called "Vaporetto" in the singular and "Vaporetti" in the plural. Piazzale means "big square" and not small square, as many tourists believe. There are also buses to Treviso airport. Buying an online-ticket for the Airport Shuttle Bus has advantages. You do not have to look for the ticket-counter, you have no problems with the foreign language and you do not have to wait in long queues. We always buy the tickets for the airport bus at home on the Internet before the trip. This online-tickets cost just as much as at the ticket-counter in the airport (8 euros one way, 15 euros return in the year 2019). With an online tickets you are not bound to a certain bus, the tickets can be canceled up to one day before the journey free of charge. Express Buses to Venice and Mestre run several times an hour during the day. In Venice these buses to and from the airport are called "Airport Shuttle Buses". 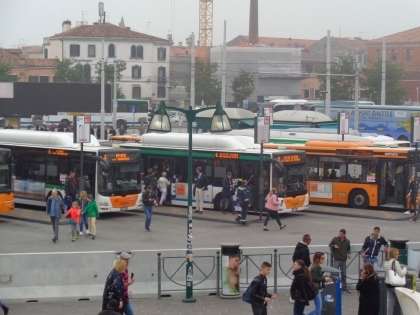 A new transport system has been in place at Piazzale Roma Venice for several years. It's a super-modern train without a driver. The People Mover connects the Piazzale Roma bus station with new parking garages on an artificial island and the cruise ship terminal. The price for the People Mover Venice is 1,50 Euro one way. Many tourist take a ride just for fun, the People Mover is an attraction in Venice.